This volume brings together articles on various aspects of the intellectual and social histories of Islamicate societies and of the traditions and contexts that contributed to their formation and evolution. 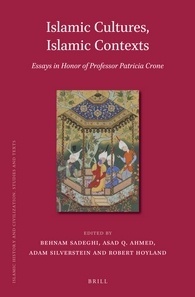 Written by leading scholars who span three generations and who cover such diverse fields as Late Antique Studies, Islamic Studies, Classics, and Jewish Studies, the volume is a testament to the breadth and to the sustained, deep impact of the corpus of the honoree, Professor Patricia Crone. Contributors are : David Abulafia, Asad Q. Ahmed, Karen Bauer, Michael Cooperson, Hannah Cotton, David M. Eisenberg, Khaled El-Rouayheb, Matthew S. Gordon, Gerald Hawting, Judith Herrin, Robert Hoyland, Bella Tendler Krieger, Margaret Larkin, Maria Mavroudi, Christopher Melchert, Pavel Pavlovitch, David Powers, Chase Robinson, Behnam Sadeghi, Adam Silverstein, Devin Stewart, Guy Stroumsa, D. G. Tor, Kevin van Bladel, David J. Wasserstein, Chris Wickam, Joseph Witztum, F. W. Zimmermann.